The Icetime® Plus Extreme 37L hard cooler is suitable for longer camping trips or outings with family and friends it will keep your contents cool for more than 24 hours! Additionally, with the new antimicrobial liner Icetime® Plus Extreme 37L will keep your contents fresh and protected from odor, mold & mildew. 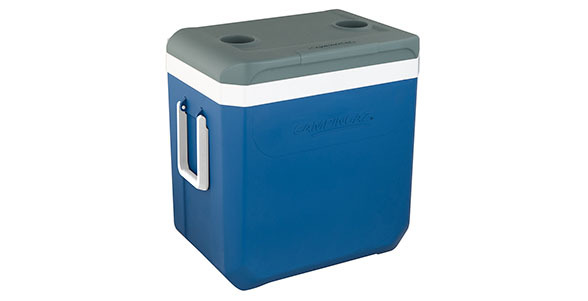 Packed with more features including a tough outer shell, high-quality PU insulation, plus a PU-insulated lid for even better performance and that also include 2 cup-holders, this Icetime® Plus Extreme 37L cooler is the top pick. Made in Italy. There are no spare parts currently available for this product. New models feature increased insulation in the lid (Icetime Plus Extreme & Powerbox Plus) and base, and reduced insulation on the sides, resulting in smaller exterior dimensions yet retaining interior capacity and performance. The Antimicrobial additive is bonded in the material and there is no risk of it being scratched or washed off. It is very strong and won’t weak over time - it’s there for the life of the product. The Antimicrobial barrier ensures the product resists mold and mildew growth and it also blocks unpleasant odors from developing. It is totally safe. The active ingredient in the antimicrobial substance is also used in common dandruff shampoos and artificial food additives. Consumers come in contact with the substance daily and in some cases digest it without any ill effects. The Antimicrobial surface is environmentally and eco-friendly. Cooler is designed with a lip on the lid, which locks perfectly into the case for a secure seal. Our click and lock system emits a reassuring “click” when you shut the lid, so you know the cooler is firmly sealed! Hinged lids fit snuggly into the case, while the bail-style handle snaps perfectly behind, making the cooler compact for easy transportation. Cooler opens wide at the top, to make filling quick and easy. Lid is also designed at the perfect angle, so the cooler won’t fall backwards whether it’s empty or full.